The command is Right (Left) Flank, MARCH, given as the heel of the right (left) foot strikes the ground. 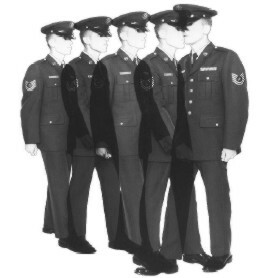 On the command MARCH, the airman takes one more 24-inch step, pivots 90 degrees to the right (left) on the ball of the left (right) foot, keeping the upper portion of the body at the position of attention. Then step off with the right (left) foot in the new direction of march with a full 24-inch step and coordinated arm swing. Arm swing is suspended to the sides as the weight of the body comes forward on the pivot foot. The pivot and step off are executed in one count. This movement is used for a quick movement to the right or left for short distances only. Throughout the movement, maintain proper dress, cover, interval, and distance. The command is Right (Left) Flank, MARCH. 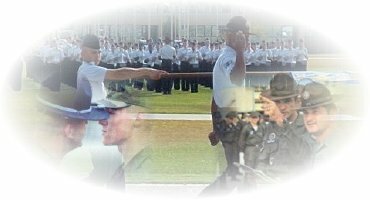 On the command MARCH, the airman executes a 90-degree pivot on the ball of the right (left) foot and, at the same time, steps off with the left (right) foot in the new direction with coordinated arm swing. The pivot and step are executed in one count, and proper dress, cover, interval, and distance are maintained.